It has been established that many chemotherapeutic agents are associated with a variety of ocular side effects. As an antineoplastic agent, 5-fluorouracil (5-FU) is the chemotherapeutic agent that is frequently linked with cicatricial ectropion. Capecitabine is a prodrug of 5-FU and has a more favorable side effect profile than 5-FU. Frequent side effects of capecitabine include gastrointestinal events and hand–foot–mouth syndrome; cicatricial ectropion is rather uncommon. Enzyme deficiencies affecting the capecitabine metabolism have been reported to be associated with exaggerated generalized systemic and cutaneous side effects; however, there are no cases in the literature reporting capecitabine-induced isolated bilateral-progressive ectropion. Although cessation of the agent is frequently sufficient for the treatment of ectropion, close follow-up is indicated in such patients as permanent damage may occur if the problem is left untreated. We report a case of capecitabine-induced bilateral cicatricial ectropion refractory to treatment cessation, ultimately requiring surgical treatment. The number of chemotherapeutic agents is growing year by year, increasing the physicians’ responsibilities on surveillance and the management of possible side effects that may be caused by a specific antineoplastic agent. Each compartment of the orbit and the eye may be affected by different chemotherapeutic regimens. As a chemotherapeutic agent, 5-fluorouracil (5-FU) is known to be associated with various ocular side effects, such as nystagmus, blurred vision, diplopia, blepharospasm, keratitis, conjunctivitis, epiphora, and cicatricial ectropion. Capecitabine, an orally administered antineoplastic agent, is a prodrug of 5-FU. It is generally well tolerated and poses a more favorable adverse effect profile than 5-FU, with the most common side effects being hand–foot–mouth syndrome and gastrointestinal events such as abdominal pain, diarrhea, nausea–vomiting, constipation, and stomatitis. As mentioned, 5-FU is known to cause cicatricial ectropion in addition to other ocular side effects, however reported cases of development of cicatricial ectropion as a result of capecitabine treatment are limited. The objective of this study was to present a case of ectropion secondary to the use of capecitabine and to discuss the treatment approach. Informed consent was obtained for the publication of the included images. A 72-year-old man was referred to our clinic with severe bilateral ectropion. In 2015, an abdominal mass was detected in the left lobe of the patient’s liver during his follow-up. The mass was biopsied and pathologically diagnosed as cholangiocellular carcinoma for which he was maintained on treatment with capecitabine, 500mg daily, after the completion of gemcitabine and cisplatin combination regimen. At the end of the 3rd month of capecitabine treatment, the patient noticed increased tenderness and progressive bilateral ectropion in addition to upper lid shortening, hyperpigmentation, and cutaneous sclerosis around the head and neck region. He was consulted to the dermatology department for further assessment, and an incisional skin biopsy was planned. Biopsy results showed nonspecific findings with areas of interstitial granulomatous dermatitis accompanied by elastophagocytosis. These findings without the evidence of any previous periorbital surgery were considered as an adverse effect of the capecitabine treatment. 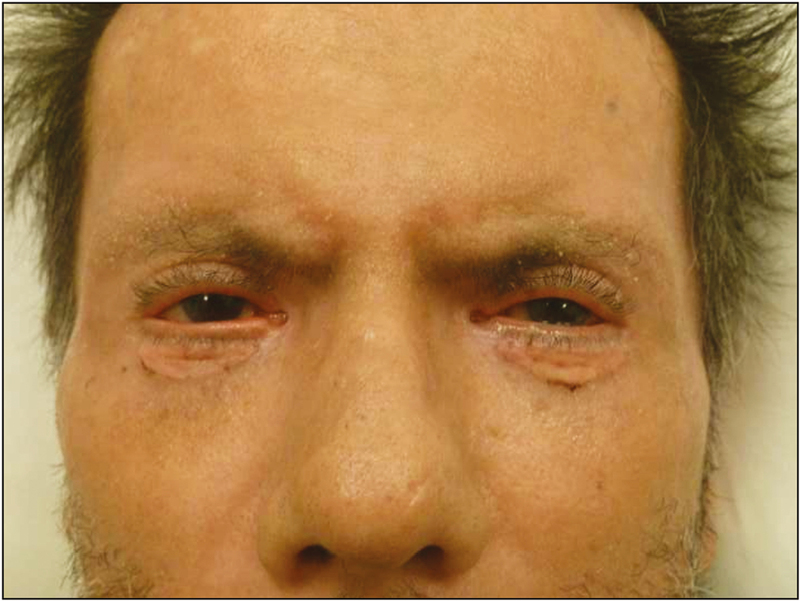 The patient was followed up by the dermatology and ophthalmology departments, and as he had no corneal abrasion and visual problems, he was managed medically with topical Vaseline and clobetasol propionate cream (0.05%), moxifloxacin antibiotic eye drops, and artificial tears for ocular symptoms. Capecitabine was stopped in the 5th month of treatment because of severe bilateral corneal erosion in addition to the progression of lower lid retraction during follow-up. 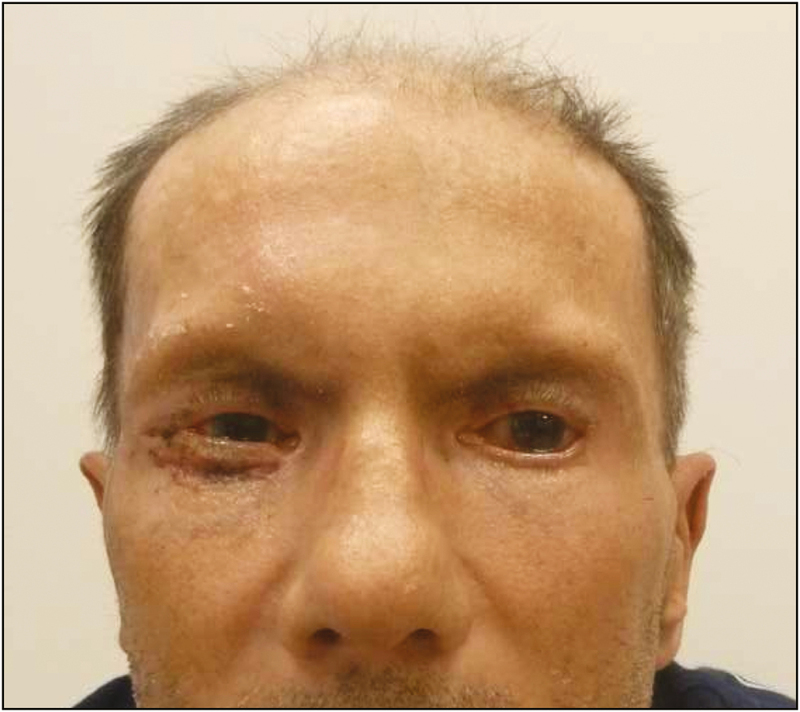 His upper lid shortness did not change, whereas the corneal erosion and lower lid ectropion did not resolve and continued to progress; therefore, he was referred to the plastic and reconstructive surgery department 1 month after the capecitabine treatment was stopped. Physical examination revealed bilateral lower lid ectropion, bilateral vertical shortening of the upper eyelids, and lagophthalmos [Figure 1]. During the 1-month drug-free period leading up to the surgical procedure, the patient’s findings seemed to worsen with the exception of upper lid shortening, which necessitated surgical intervention. 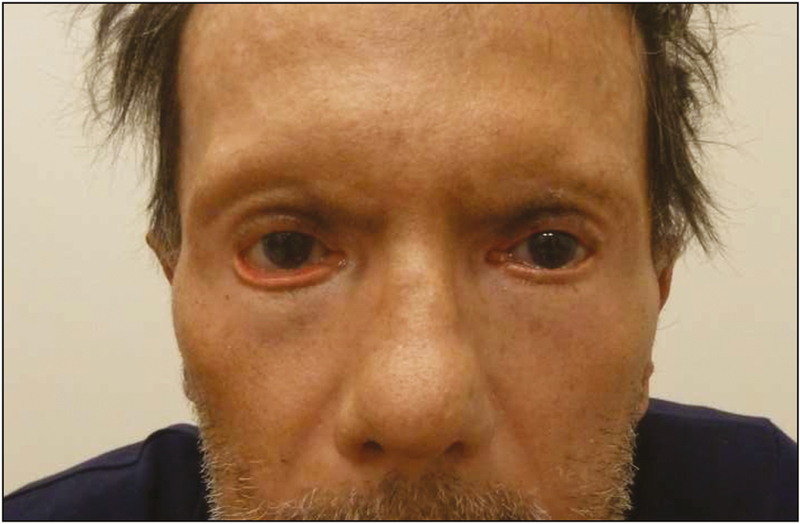 He was treated with surgical release of the lower eyelid skin followed by bilateral full-thickness skin grafting, with grafts obtained from the supraclavicular area. Healing of the grafts and the early postoperative period were uneventful [Figure 2], yet recurrent ectropion was noted on the 6-month follow-up examination on the right lower eyelid [Figure 3]. A second surgery was planned and ectropion repair was undertaken with surgical release of the lower eyelid skin accompanied by a lateral tarsal strip procedure followed by full-thickness skin grafting. No complications were noted in the postoperative period and later, the patient was followed up without any significant ocular complaints [Figure 4]. The increasing number of chemotherapeutic agents continues to add to the list of side effects that require the attention of physicians. Some of the agents that are notorious for their ocular toxicity and should be followed up closely include cytosine arabinoside, docetaxel, methotrexate, and 5-FU. 5-FU, a widely used chemotherapeutic, works as a thymidylate synthase inhibitor and pyrimidine analog. Ocular toxicity has been reported to be around 25%–38% in patients using 5-FU and has been generally noted to resolve on discontinuation of the drug.,Ocular side effects include ocular pain, increased tearing, blurred vision, photophobia, and cicatricial ectropion. Both topical and systemic uses of 5-FU were reported to be associated with the development of ectropion.,,, Eiseman et al. reported that ocular complications occur on an average of 3 months after the initiation of 5-FU therapy and may rarely result in permanent changes that do not resolve after therapy is discontinued as the refractory cicatricial ectropion rate was 1.9% in their study. In our case, ectropion started 3 months after starting capecitabine, and the patient was managed medically until the 5th month. Occurrence of severe corneal erosion during medical treatment and progression of the symptoms until and even after cessation of capecitabine required surgical intervention. Compared to 5-FU, capecitabine was shown to have a lower incidence of serious side effects, such as stomatitis and hematological toxicity. However, specific side effects related to capecitabine use, such as hand–foot–mouth syndrome or gastrointestinal problems such as diarrhea, constipation, nausea and vomiting, and abdominal pain, also exist.,Despite these side effects, capecitabine has a lower rate of ocular toxicity compared to 5-FU, with approximately 10% of patients developing ocular irritation and other rare ocular side effects including keratitis, decreased visual acuity, and corneal deposits. Although capecitabine is a prodrug of 5-FU and cicatricial ectropion is a known side effect of 5-FU, bilateral cicatricial ectropion and periocular changes caused by capecitabine were only reported by Obi et al. In their case, they detected an enzyme deficiency regarding the pyrimidine metabolism, dihydropyrimidine dehydrogenase (DPYD) coded by the DPYD gene, which led to the accumulation of 5-FU and resulted in systemic and generalized toxicities including bilateral ectropion.There are other case reports arguing that DPYD deficiency can result in an exaggeration of capecitabine toxicity; however, cicatricial ectropion was not noted as a part of the side effects that were listed. In comparison to the case report by Obi et al., our patient’s findings were not systemic, and cutaneous toxicity was only localized to the head and neck region. Moreover, Obi et al. stated that their patient, who presented with systemic findings such as severe neutropenia, mucositis, odynophagia, fatigue, generalized rash, diarrhea, and polyuria on the 9th day of chemotherapy, was found to have bilateral cicatricial ectropion on the 6th day of hospitalization. Late presentation of our case in addition to the localization guided us away from the enzyme deficiency, which is why, we did not perform any enzyme studies. Treatment of cicatricial ectropion caused by either 5-FU or capecitabine varies from case to case. In the literature, cicatricial ectropion because of 5-FU treatment may or may not require cessation of the drug depending on the severity, and as aforementioned, discontinuation of the drug may lead to resolution in 1–2 weeks. In addition to discontinuation of 5-FU, topical treatment with corticosteroids may be required. As Hurwitz mentioned in their case report of two subjects, ectropion resolved completely after twice-daily dexamethasone ointment therapy. Two of the four cases reported by Straus et al. failed to respond to topical steroid ointments and required plastic surgery for lower lid ectropion, which was caused by systemic 5-FU treatment. The remaining two cases showed complete or partial improvement with topical steroids. 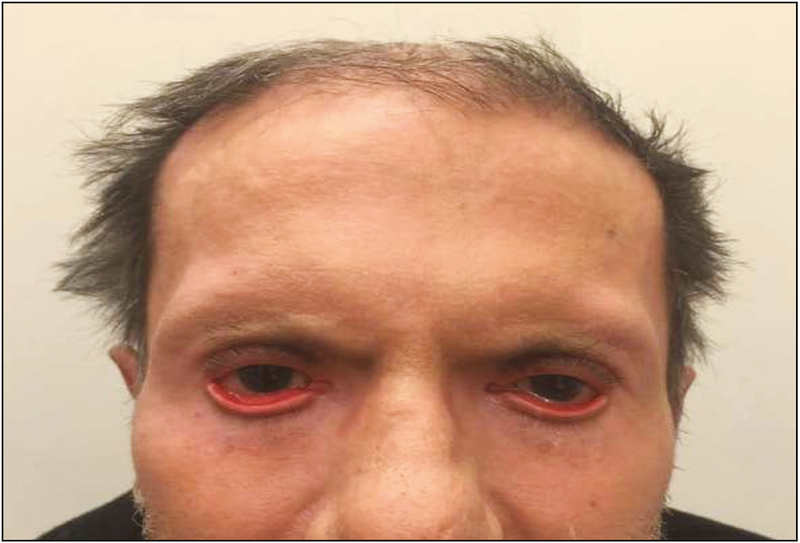 The only case of bilateral ectropion, caused by capecitabine use, was managed conservatively with topical agents because the patient’s condition did not allow any further treatment. In our case, the progression of corneal and conjunctival symptoms after discontinuation of capecitabine and the absence of adequate improvement with topical conservative therapy directed us to surgical management. To the best of our knowledge, this is the only case of bilateral cicatricial ectropion, caused by capecitabine, requiring surgery because reported cases of cicatricial ectropion associated with capecitabine or 5-FU use showed improvement with the discontinuation of the offending agent or with conservative medical management. 5-FU and in rare circumstances, capecitabine can cause cicatricial ectropion, and although most symptoms regress with discontinuation of the drug and conservative treatment, close follow-up of these patients is warranted as the condition may not resolve, progressing and ultimately requiring surgical management. Schmid KE, Kornek GV, Scheithauer W, Binder S. Update on ocular complications of systemic cancer chemotherapy. Surv Ophthalmol 2006;51:19-40. Saif MW, Katirtzoglou NA, Syrigos KN. Capecitabine: an overview of the side effects and their management. Anticancer Drugs 2008;19:447-64. Eiseman AS, Flanagan JC, Brooks AB, Mitchell EP, Pemberton CH. Ocular surface, ocular adnexal, and lacrimal complications associated with the use of systemic 5-fluorouracil. Ophthalmic Plast Reconstr Surg 2003;19:216-24. Reeder RE, Mika RO. Ectropion secondary to bolus injection of 5-fluorouracil. Optometry 2001;72:112-6. Hurwitz BS. Cicatricial ectropion: a complication of systemic fluorouracil. Arch Ophthalmol 1993;111:1608-9. Straus DJ, Mausolf FA, Ellerby RA, McCracken JD. Cicatricial ectropion secondary to 5-fluorouracil therapy. Med Pediatr Oncol 1977;3:15-9. García-González X, López-Fernández LA. Using pharmacogenetics to prevent severe adverse reactions to capecitabine. Pharmacogenomics 2017;18:1199-213. Obi EE, McDonald A, Kemp E. A bilateral cicatricial ectropion and bilateral upper lid shortening caused by 5-fluorouracil toxicity in a patient with dihydropyrimidine dehydrogenase deficiency. Cutan Ocul Toxicol 2011;30:157-9. Kodali S, Bathini V, Rava P, Tipirneni E. Capecitabine-induced severe toxicity secondary to DPD deficiency and successful treatment with low dose 5-fluorouracil. J Gastrointest Cancer 2017;48:66-9. Koç Üniversitesi Hastanesi, Davutpaşa caddesi, No:4 Topkapı 34010 Istanbul/Turkey. T: +908522508250, M: +905055039521, F: +902123113410.